One of the prerequisites of working in this diocese is having to go on retreat once a year. I don’t like being away from the wife & kids for four nights in arrow, but I have to say, I do like the opportunity to have a week without a big agenda (apart from doing church 4!times a day…). Time to think deeply about important things. Time to read books. I’d say that there is time to chat to your peers, but it’s a silent retreat, so there isn’t even dinner time conversation (incidentally, despite the expectation of many, I really enjoy silent retreats. 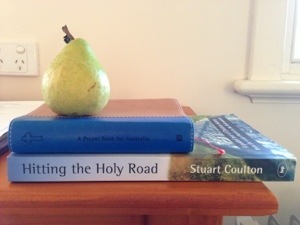 Reading Stuart Coulton’s “Hitting thenHoly Road has been fitting, as he speaks of monasticism, and I feel like I’ve taken a vow of silence). I’ve allowed myself just a little time to mention why I’ll be a bit quiet this week, then I might even have some time away from the Internet!